This Superhot puree contains no added vinegar and the hottest and most delicious peppers in the world! The Trinidad Scorpion,The Carolina Reaper,Bhut Jolokia,and the Red 7-Pot! Complemented with sun dried tomatoes, garlic,sea salt and a splash of lemon juice! 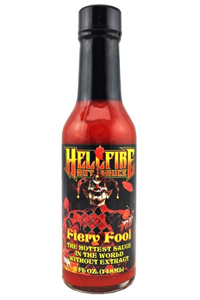 This sauce has a delicious superhot flavor and goes well in anything you want to add some superhot flavor and heat to! This is a full 5oz bottle of superhot goodness! Very Hot! Use Caution and Enjoy!!! Love this sauce ! Beautiful robust flavor with a good amount of heat ! Delicious ! Ingredients: Bhut jolokia peppers, Trinidad scorpion peppers, red 7 pot peppers, Carolina reaper peppers, sun dried tomatoes, garlic, sea salt, cumin, lemon juice.